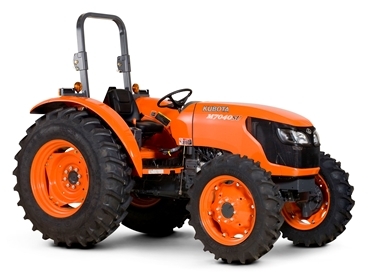 Kubota Tractor Australia has released a new low budget tractor in their M-Series line up. The new M7040SUD – Special Utility Tractor, is based on the very popular M40 Series range introduced to the Australian market in 2006. “Kubota M40 series tractors have had fantastic customer feedback in regards to their high productivity and low running costs. Now, with the introduction of the new M7040SUD, price conscious buyers can access a low budget tractor manufactured to Kubota Tractor Australia's high standards of performance and reliability,” says Peter Gloury Sales Manager for Kubota Tractor Australia. The M7040SUD low budget tractor can also be fitted with the Kubota LA1153E hydraulic self levelling loader that was introduced to the Australian market in early 2009. The loaders can be fitted with a range of Kubota implements. A 3rd function valve and Kubota’s Shockless Ride Accumulator system are available as an option. The shockless ride absorbs the jolts when travelling over uneven surfaces, resulting in a smoother ride for the operator. The M7040SUD model features the same sophisticated look as Kubota’s recently released tractors with slanted bonnet, halogen headlights, newly designed front grille for improved visibility and enhanced operator comfort.